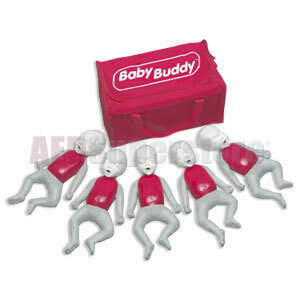 Life/form® Baby Buddy Manikin Multi-Packs. 5-Pack consists of 5 infant manikins, 50 lung/mouth protection bags, one carrying bag, and an instruction manual. 10-Pack includes 10 infant manikins 100 lung/mouth protection bags, 2 carry bags, and instruction manual. Select desired multi-pack using the dropdown window above. Five-year warranty. Not made with natural rubber latex. Conforms with ISO 9001 and ISO 13485.